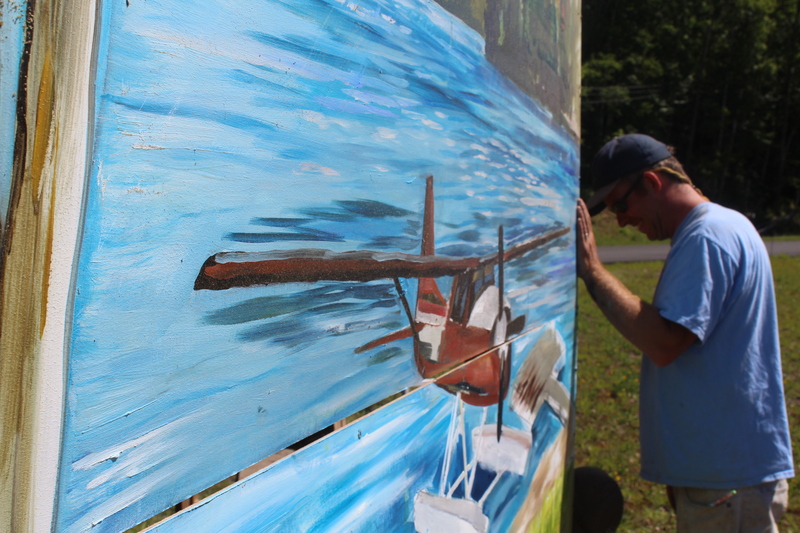 Local Adirondack Artist and Long Lake native Matthew Burnett has installed a series of outdoor paintings entitled Portraits in the Wilderness. 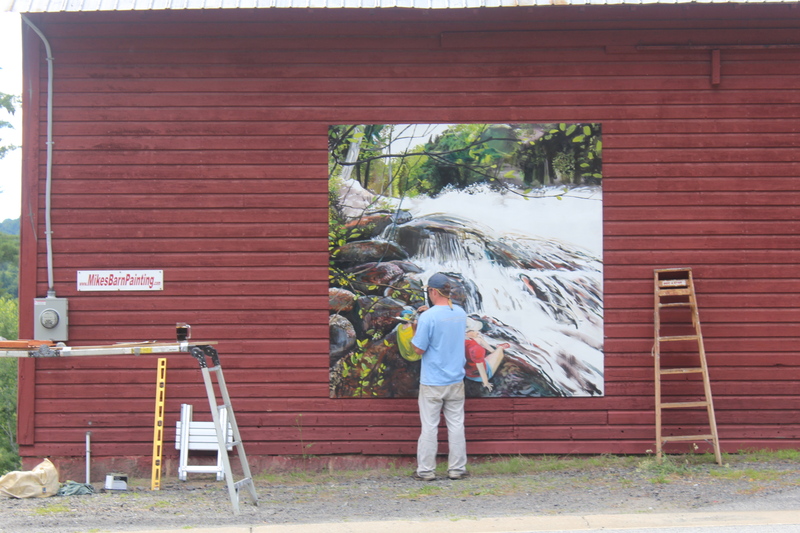 “Portraits of the Wilderness” will be a series of outdoor installations composed of 8’x8’ murals mounted in various locations throughout Long Lake. 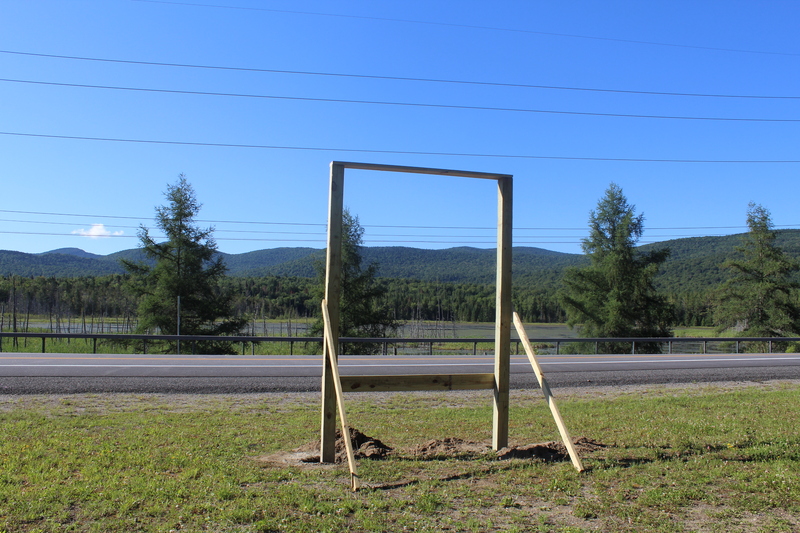 The art showcased will celebrate the landscape of the Adirondack wilderness by connecting the natural world to the sense of place and community we live in. “Portraits in the Wilderness” is designed to provide easy access to high quality art to residents and visitors of Long Lake. 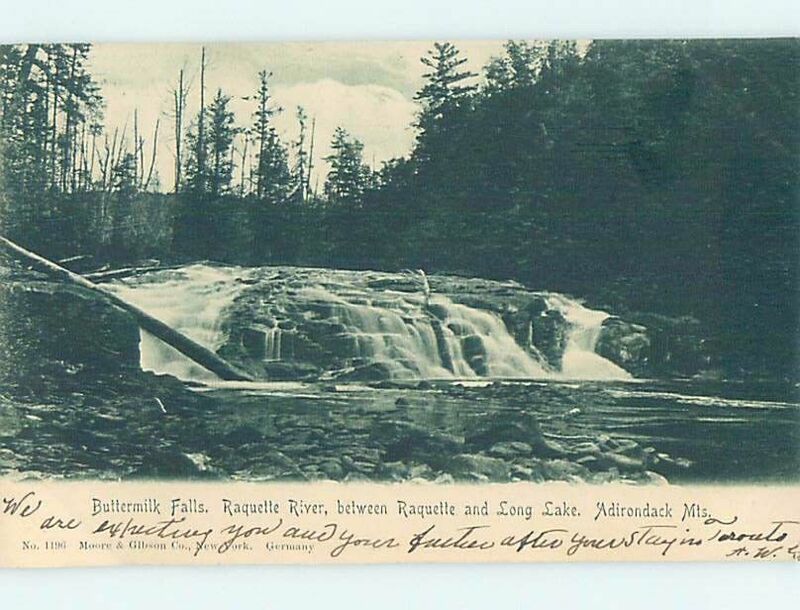 This exhibit will be open and free for all to enjoy, including travelers in and around the region accessing the Adirondack Trail Scenic Byway and the Roosevelt-Marcy Scenic Byway along NYS Routes 30 and 28N. 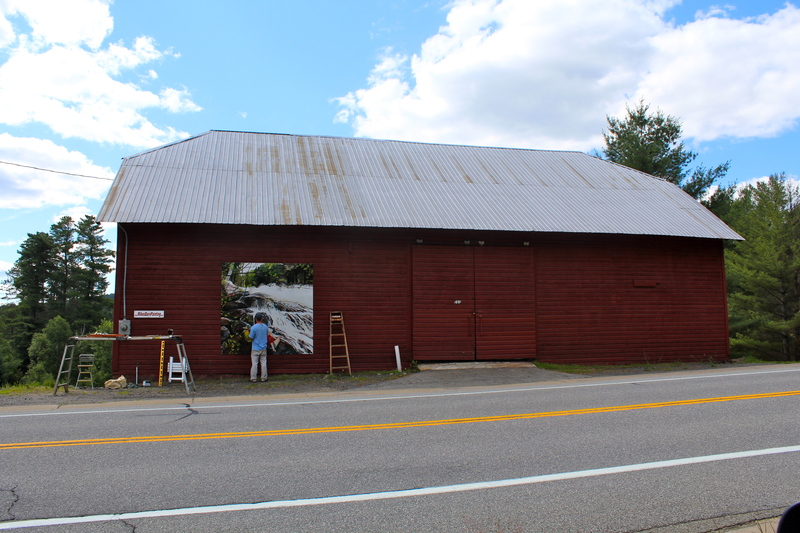 The first three installations will be located at the Shaw Pond rest area on route 28N, the site of the former Blarneystone on Main Street and a location along Deerland Road located on a historic barn currently owned by Fred Fink. 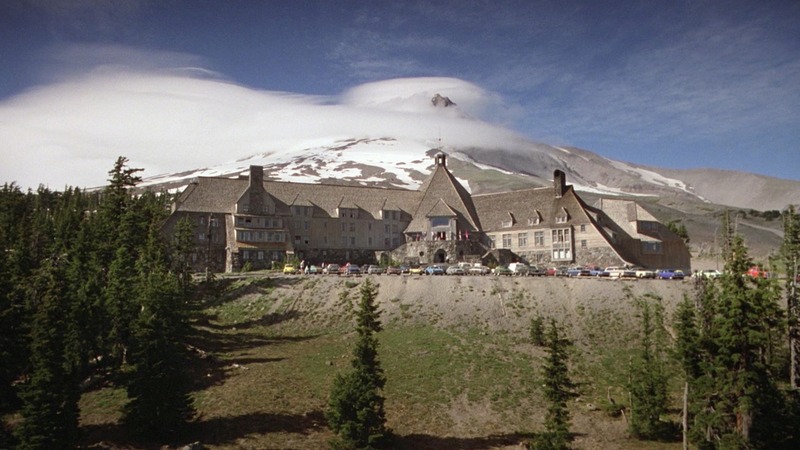 Site selection was based on covering multiple locations to maximize visibility and impact. Three portraits based on iconic historic Long Lake characters will be installed in August at a location to be announced. The project will be up through the end of 2014. Matt Burnett is a native of the Adirondacks, growing up in what is now the William C. Whitney Wilderness Area. Burnett is an Assistant Professor at SUNY Canton, where he teaches in the Graphic and Multimedia Design Program. His work has been exhibited in regional and international exhibitions including the Long Lake Winter Outdoor Art Installation in 2011, E-Lumination. This event is made possible with public funds from the New York State Council on the Arts Decentralization Regrant Program. 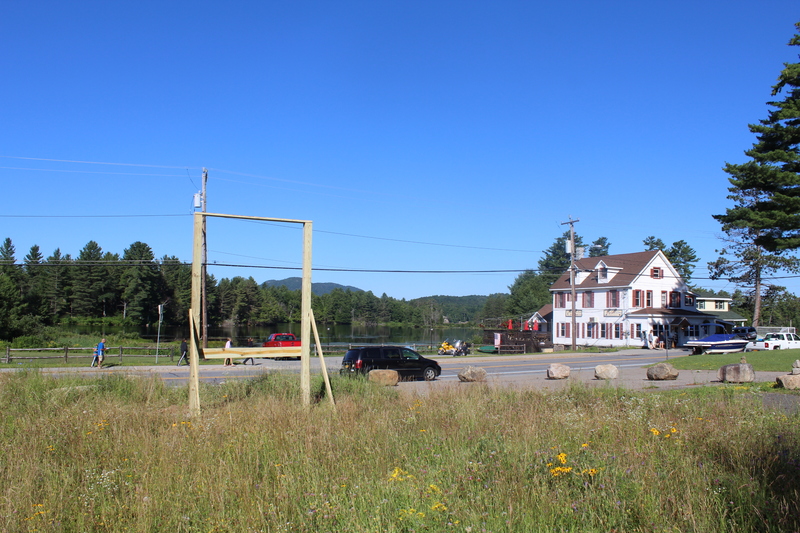 The Decentralization Program is administered by the Adirondack Lake Center for the Arts. Professional mountain bike stunt rider Chris Clark will awe spectators with his daring performance on July 22nd at 3pm on the Long Lake Ball Field. Chris Clark has been competing and performing around the world for the past 15 years. He has competed in over 50 National Mountain Bike Events and the World Championships in Spain. He has also performed around the world and in thousands of venues, including Times Square, the Gravity Games, the Olympic Games, and for the NFL. This thirty minute show will be a breathtaking display of balance and agility. Clark will maneuver over custom built ramps and obstacles, displaying the skills he has developed through years of national and international competitions. This is all part of a special Long Lakey Kids’ Day on July 22nd on the Long Lake Ball Field from 12pm-4pm. Look for a giant inflatable obstacle course from 12-4pm and a tie dye workshop 1pm – 2pm followed up by Chris Clark Show at 3pm. Free admission. Parking available at Long Lake Central School. For more information, please call the town offices at 518-624-3077. The US Waterski Show Team returns to Long Lake NY at the Long Lake Town Beach on Saturday, July 19th. Demonstrations of pyramids, tricks and barefoot waterskiing begin at the Town Beach starting at 10am with the team performance at 3pm. The showcase will be along the waterfront in front of the Helms Aeroplane Base and the Long Lake Town Beach along NYS Route 30. Spectators are invited to enjoy a dazzling array of synchronized jumps and quadruple-decker pyramids and glittery costumes. The US Waterski Show Team is a water-ski club based out of Scotia NY where they can be seen weekly on Tuesday nights in front of Jumpin’ Jacks Drive In along the Mohawk River. The club was founded in 1968 and it is the only one in New York State. Members of the waterski club include schoolteachers, engineers, contractors and college students. Look for an outstanding entertaining performance as it’s the last big showcase before the Northeast Regional Championships slated for the following weekend. Look for this winning team to perform an outstanding show displaying creativity, enduring athleticism and unbridled enthusiasm. Other beach activities on July 19th include the Cardboard Boat Box Race Float Off Contest starting at 11am. Children of all ages build a boat out of cardboard and duct tape provided by the Town of Long Lake from 11am to 1pm. Pre-built boats are welcome to float, but boats must be made strictly out of cardboard and tape. No floatation devices or Styrofoam can be part of the construction of the boat. The Float Off competition starts at 1pm. The last boat floating wins prizes from local businesses. All activities are at the Long Lake Town Beach located at 1258 Main Street, NYS Route 30, Long Lake, NY. Free Parking is available at Long Lake Central School located on School Street off of Main Street, Route 30, along Becker Road behind the Town Hall. Spectators are asked to not use St. Henry’s Parking Lot as services are scheduled at 4pm on Saturday. Games for all ages on the Long Lake Ball Field were a great success and boasted over 300 participants. Events included a scavenger hunt and piñata for children five and under. Other crowd favorites included the sack race, three-legged race, the crab walk, barrel race and the finale egg toss with winners Milo Gillies and Miles Dean. Winners for the 2014 Egg Toss are Milo Gillies and Miles Dean. The Long Lake Bed Races shut down traffic on NYS Route 30 at 5pm and featured host Peter-Michael Marino introducing the racers, and conducting hilarity on the sidelines during the race. Four teams vied for the championship cup. Winner for Best in Show was Team Huntington Tree Huggers with Chrissy Macholl, Mark Frazier, Lee Daudelin, Nick Harover, Kristopher Weber. Overall First Place went to the Jersey Devils with Mark Goerg, Nicholas Goerg, George Duerr, Paul Euicci and Dalilah Gomez. The Jersey Devils competed in two heats taking home first place by besting the brackets. Second Place went to Wallace Contracting/The Cellar Bed and Third to the Huntington Tree Huggers. Special thanks to all the judges who helped with the bed races. 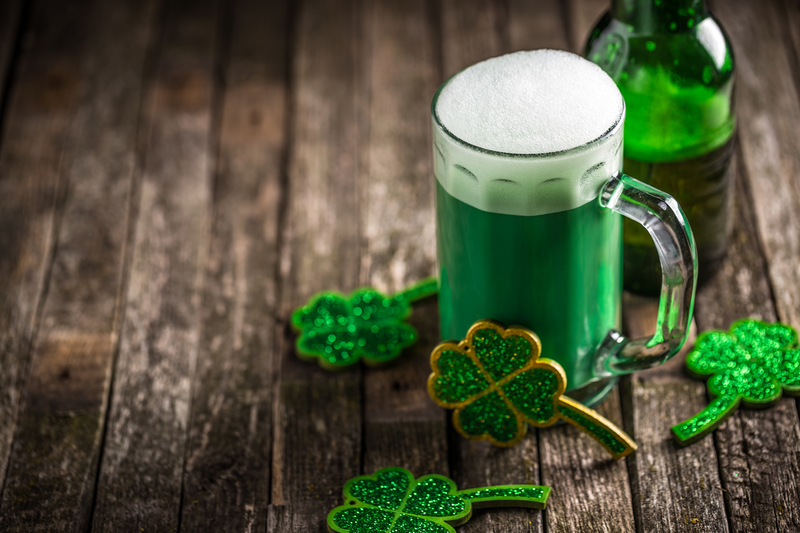 Mike McNamara, Lara McNamara, Kate O’Dowd, Molly Irvine, Carol Irvine, Colleen Smith, Paul Roalsvig, Brian Penrose, Kathryn Cusamano, Jim and Lisa Tebo, Briggs and Pailin Hample and Barb Gachowski. This is the first win and second race in the last five years for the Jersey Devils. 5pm Bed Races from Bridge to beach with host comedian Peter-Michael Marino. Expect Delays as NYS Route 30 will be closed on and off and only allow one lane of traffic thru between heats. July 3d – Smokey Greene Concert, St. Williams on Long Point, 7pm. July 5th – Rhythm Blooze Hounds Perform at Raquette Lake School 6:30 – 8:30pm.